May 3, 1978 had been designated as "Sun Day" -- a day set aside, in the United States, to bring attention to the potential uses and advantages of solar energy. In New Orleans, ten and on-half inches of rain fell on the metropolitan area; eight and two-tenths inches fell between 7:45 and noon, which was double the amount which could be pumped from the streets. Much of the city and metro-area experienced two to five feet of standing water my mid-afternoon. Property damage was extensive. 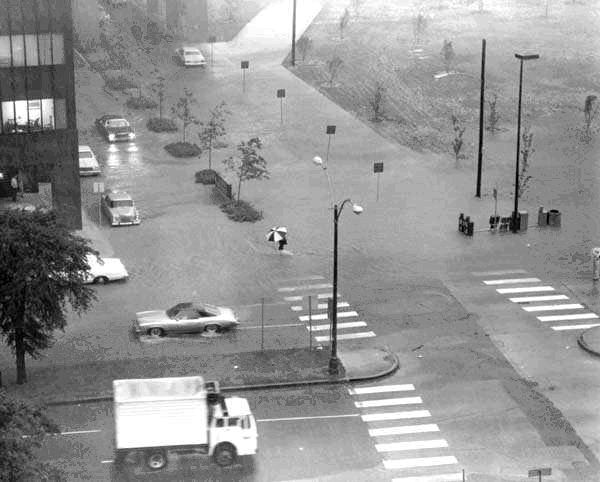 Many New Orleanians still remember "The May 3rd Flood", and could tell you exactly where they were when the water rose. This photograph, from the New Orleans Public Library, captures the scene at the intersection of Poydras and Lasalle Streets. Photo of Mayor Ernest N. Morial speaking at the ceremony renaming the Calliope Housing Project as the B. W. Cooper Apartments, May 3, 1981. On May 3, 1849, a Mississippi River levee breach upriver from the city (around modern River Ridge, Louisiana) created the worst flooding the city had ever seen. The flood, known as Sauvé's Crevasse, left 12,000 people homeless. While New Orleans has experienced numerous floods large and small in its history, the flood of 1849 was of a more disastrous scale than any save the flooding after Hurricane Katrina in 2005. New Orleans has not experienced flooding from the Mississippi River since Sauvé's Crevasse, although it came dangerously close during the Great Mississippi Flood of 1927. Clarence Ray Nagin, Jr. (born June 11, 1956), also known as C. Ray Nagin, our 60th mayor, became internationally known in 2005 in the aftermath of Hurricane Katrina. Nagin was first elected in March 2002 and received significant crossover vote from just about every segment of the population. He was re-elected in 2006 even though the election was held with at least two-thirds of New Orleans citizens st ill displaced after Katrina struck. He was term limited by law and left office on May 3, 2010. After leaving office, Nagin founded CRN Initiatives LLC, a firm that focuses on emergency preparedness, green energy product development, publishing and public speaking. 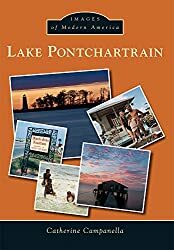 He wrote and self-published his first book, Katrina Secrets: Storms after the Storms which gives a first-hand account of how New Orleans overcame the effects of Hurricane Katrina. On January 18, 2013, Nagin was indicted on 21 corruption charges, including wire fraud, bribery, and money laundering related to his alleged dealings with two troubled city vendors following Hurricane Katrina disaster. On February 20, 2013, Nagin pleaded not guilty in federal court to all charges. In 2014 he was found guilty of all but one charge.